I’m about to cross lines here that I’ve not crossed before. While I’ve written some, about my faith, and I’ve written a lot about my love of film, I don’t think I’ve ever really written about them both, together. I hope you’ll stick around anyway, as I think it’s a pretty good thing to discuss, whether you are a person of faith or not. 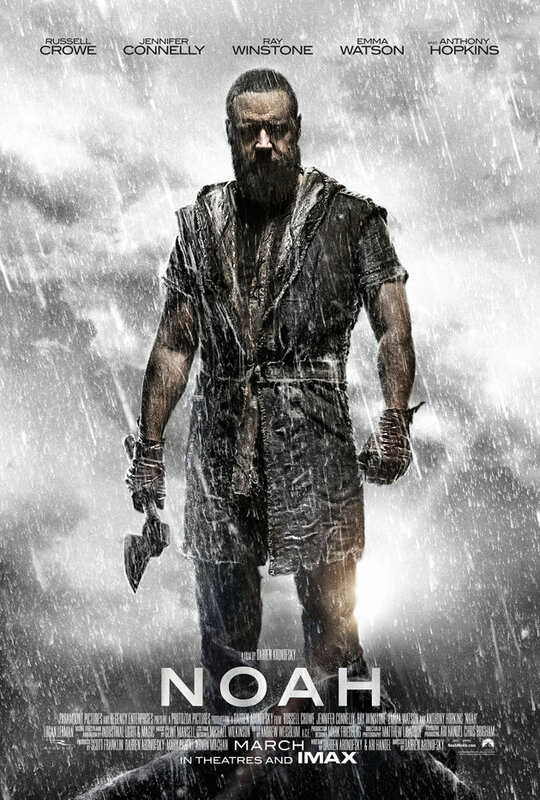 By now I’m sure you’ve heard all about how the soon-to-be-released major motion picture Noah is so controversial for this reason, or that reason. I’ve been following press on this film for about a year now, and admittedly was completely blindsided by all of the negativity that is suddenly out there about how it’s just a front with some big Hollywood agenda. This makes me a little sad because, as a Christian, I sit here and wonder why we as Christians have to get so bent out of shape and assume judgement out of things based on here-say, speculation, gossip (let’s face it, when it’s not first-hand knowledge, it’s flat-out gossip) and falsehoods. Sure, has Hollywood ever misrepresented a Christian, or God, or the Bible? of course they have… BUT, every time we open our mouths, “share” that post, forward that email or pass on our best assumptions about a film (or anything that we don’t have firsthand information about), aren’t we doing the same thing? Besides that, as Christians, we should know that we can be persecuted and misrepresented so lets stop acting like victims about it and making ourselves such easy targets. Back to Noah. I, for one, am thrilled to see this movie. I’m not much of a Russell Crowe fan, anyone who reads here knows this. That being said, I’ve been really excited about the press I’ve seen regarding the production of the film, and have been prompt to dismiss the negative speculation I’ve read. The whole ordeal has become quite a hot topic around our house, actually. We’ve debated about the rumors we’ve read, regarding the film, and discussed them rationally in the context of “so what if they’re true?” All the while, I kept secretly hoping that I’d get an email with a couple of passes so that I could go see the film and come home and write a first hand account, for all of the uninformed haters, about how Noah is portrayed as a human man. Not blameless, or perfect, but human. And that his story is an epic film, spanning in hours, what can be read over the course of minutes in the Bible, so obviously some details, dialogue and character liberties would have to be added. Until I viewed the film with my own eyes though, I felt I couldn’t say such things publicly without being another one of the many speaking without knowing, really. Then, last night, something wonderful happened. An article on the Christian Post was brought to my attention. This article is written by John Snowden, who has been the film’s Biblical Advisor for the past two years. Having both been involved in the production of, and seen the film, it’s fair to say Mr. Snowden has first-rate information regarding the film and its actual stance Biblically. Personally, I appreciate his article greatly! I couldn’t agree more with the vitality of his bullet points. I appreciate that he took the time to share not only the reasons why Christians should embrace the film, but also to explain about the things that are a bit different and why. Like, with number 7 specifically. While, apparently there have been people who were upset by the presence of a personified enemy to Noah, I found it thought-provoking. There was so much that happened in the life of Noah, that we know nothing about. If people were so wicked, how do we know he didn’t have hundreds of enemies out to destroy him? Mr. Snowden’s insight is an asset for sure. While I am sure, there will be many who still aren’t pleased, that will always be the case. It’s enough for me. Granted, I wasn’t really worrying about it. While I was approaching the film with a significant attitude filled with grace and the opportunity to use it as a gift, even if it didn’t all line up with the Bible. (And I have to clarify, I NEVER Expected it to. How many times have we watched a film based on ANY book and not liked the interpretation?) The biggest thing I’ve taken away from the Christian Post article, however, is that it’s good to strike a healthy balance between the levels of grace and knowledge. I’ll admit that, and I’m grateful for that reminder. Personally, I really enjoy things that inspire me to take something, whether it’s from a Bible passage or a piece of classic literature, and bring it to life with a visual dimension and illustration. The film Noah does that for us. It gives us a glimpse into more than just the candy colored story books that are painted for children, because this is a truly tragic and hopeful story all rolled into one. It’s human. I’m so glad that John Snowden still remains passionate enough about his work on the project to encourage people (not just Christians, but people) to embrace it. What are your thoughts one the film? On the article? I can’t wait to see it myself!!!! Thanks for crossing the line, I hope you enjoy the film!